Food has so much to do with family, even more so than we realize. Different foods and scents can take you places and bring up memories long forgotten. 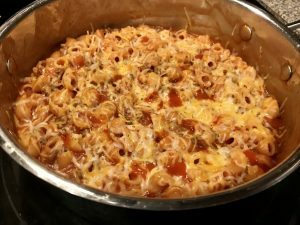 I started this blog in the memory of my late grandmother, and father in law, both of whom were amazing cooks and loved to feed people. I learned so much from both of them and just wish they had written down their recipes. Enter Mommy Spice, a place to write down recipes for my children, and hopefully their children and for you and yours too. Being able to look up a recipe and be transformed to another place in time is an amazing thing. I would give anything to know how to make my grandmother’s salad dressing or my father in law’s marinara sauce. So this inspired me to ask my Mom for my favorite recipe of hers from when I was kid. Also it only makes sense that my first featured recipe is from my number one supporter, my Mama! 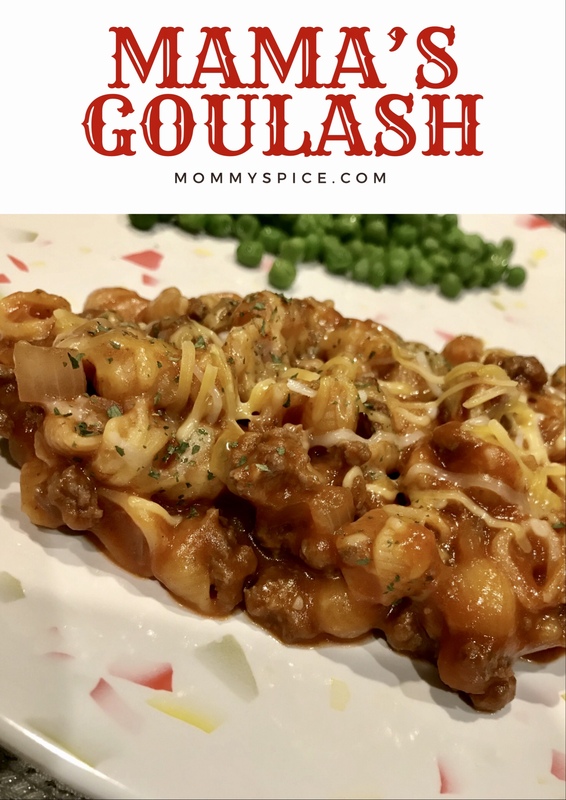 I hope that you guys enjoy her goulash as much as me, my siblings, husband and kids do. 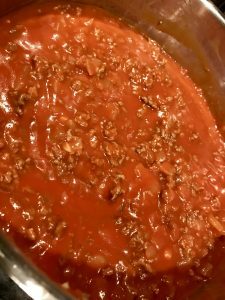 1 can tomato sauce, 8oz. In a large pot over medium heat brown and break up your hamburger meat into small pieces. Next add in your onion with a healthy pinch of salt and a pinch of crushed red pepper. While your onions cook, boil a pot of salted water and cook pasta until just al dente. When onions are translucent, add in your diced garlic clove and sauté an additional minute. Next pour in your tomato sauce and tomato soup, and stir to combine. When using the condensed soup, you add it as is. Once everything is combined, cook for 5 minutes, then you can thin out your meat mixture as desired, I usually will add half a soup can of water. If you prefer a thinner sauce, go ahead and add a full soup can of water. Next combine your al dente pasta to your meat mixture, stir to combine, then top with 1/2 cup of your cheese and turn the heat down to low. Place a lid on the pot for 2-5 minutes or until cheese is fully melted. 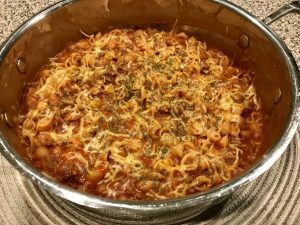 Stir goulash once more and serve hot, topped with remaining cheese. This is a weeknight staple! Only 7 ingredients and comes together in about 20 minutes. 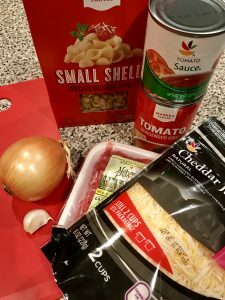 The tomato soup might seem like an odd ingredient but it gives this dish a really nice velvety, creamy flavor. Also by only using 1/2lb of hamburger this is a total budget stretcher! If you want to make this dinner even easier, you can leave out the fresh onion and garlic and instead use minced onion and garlic powder. All of the flavors will still be there, it’ll just shave off a little bit of time chopping up veggies. If going the dried spice route, I would use a 1/2 tablespoon of minced onion and 1/2 teaspoon of garlic powder, but as always taste as you go and adjust to your personal flavor choices. When my husband and I lived in a different state from my family my Mom would always make this every time she visited, it’s now become my husband’s favorite thing that she makes. As time went on and we moved closer, our love for this dish has remained the same. Now when my Mom comes to babysit our kids she’ll make this for dinner for them and always leave leftovers for us. My kids have grown to love it also, so much so that when I make it, they ask if Nana is coming over, because that’s what Nana always makes for dinner. And that’s how it all happens, food becomes family, one favorite dish at a time handed down from one generation to the next. So this one is for you Mom, thanks for all the love and for letting me share your delicious recipe.